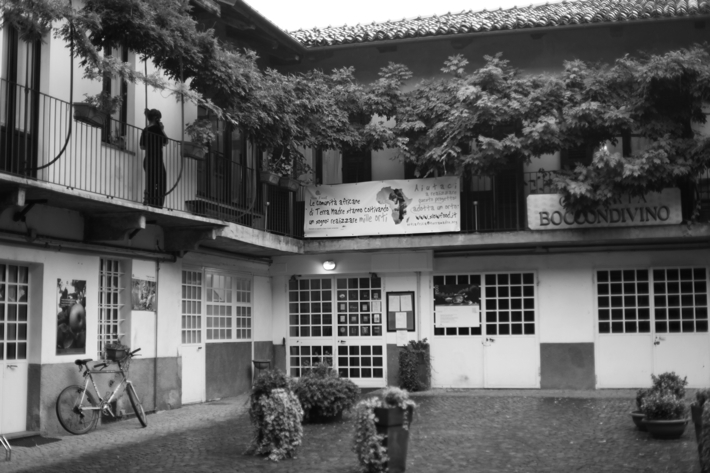 We've eaten at Boccondivino the last two times we've been to the Alba-Bra area of Piedmont, Italy. 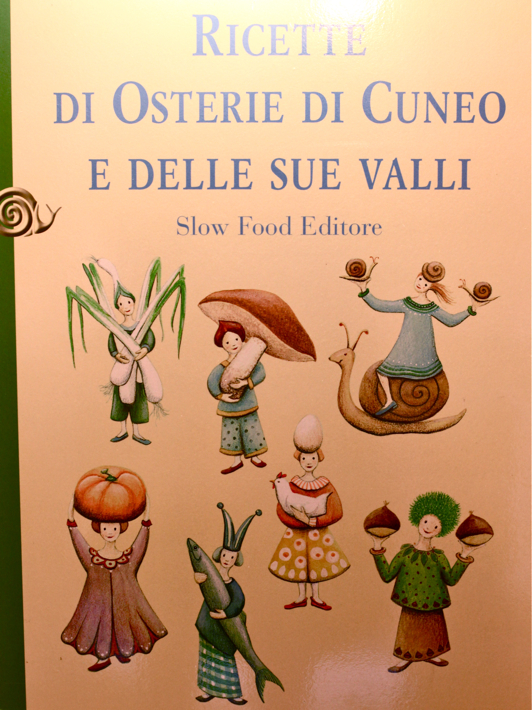 It is famous for being the origin of the Slow Food movement. But that status becomes kind of a "fun fact" when compared with the real reason for coming here: the food. The panna cotta is good enough to warrant a trip to this somewhat sleepy town. The atmosphere of this osteria is relaxed and unpretentious, and the service is efficient, warm, and hassle-free. The food here is very traditional; you'll see the same items on menus all around the Langhe region. 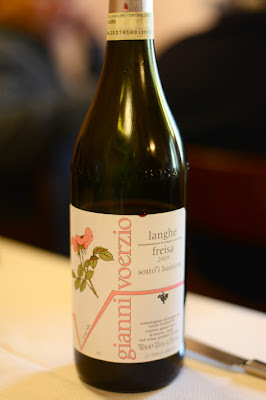 But the versions at Boccondivino always have a little extra something going on. 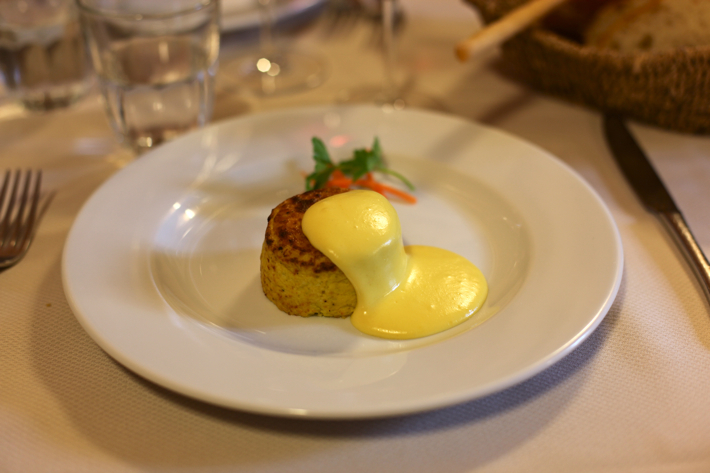 Their tartino di verdure, a baked egg and vegetable starter, is enhanced by a dollop of fonduta al Raschera, a melted-cheese sauce made with Raschera, a cheese unique to this valley. 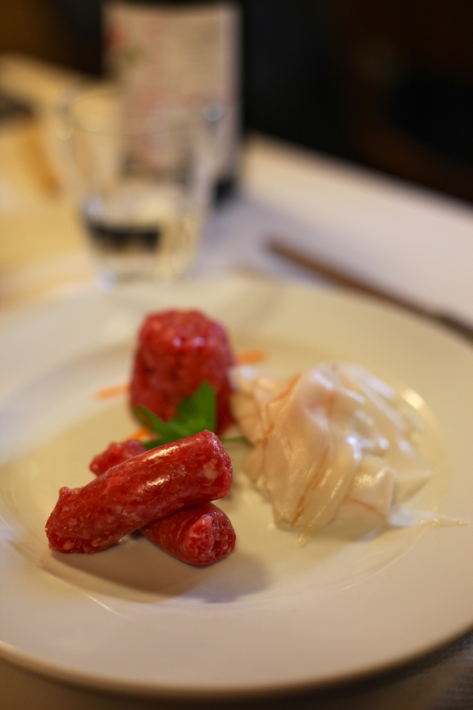 Their raw meat starter features salsiccia di Bra, a sausage made in the eponymous city that is incredibly delicious raw. 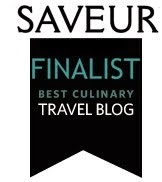 It is so good that I recently became enraged when I read an American tourist's account of ordering the starter, but not being able to bring himself to take a single bite of the raw sausage, let alone the carne cruda (veal tartare) or lardo (cured pork belly fat). What a waste of a vacation. 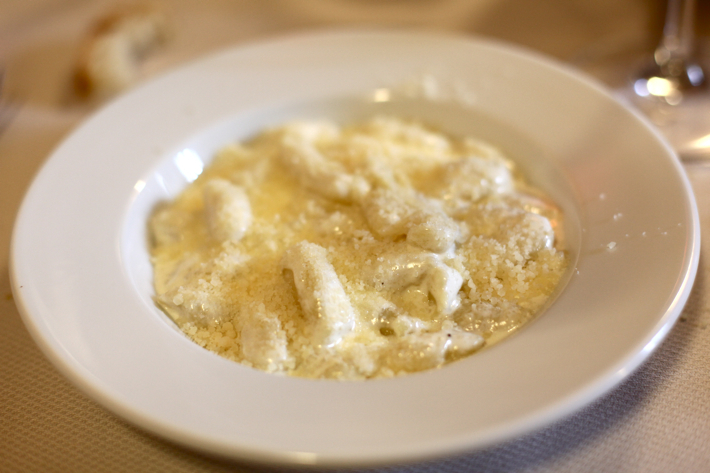 The gnocchi di patate al Raschera is one of those perfect dishes. The gnocchi on their own have a fluffy, creamy texture that alone in butter or oil would be amazing. But the addition of the tangy, rich, slightly-sharp Raschera cheese brings this dish to ethereal heights. 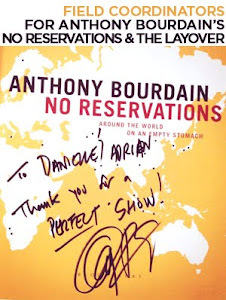 Sometimes I feel weird getting gushy about food so often, but this one really deserves it. I have a friend who works in this region often who asks if they will be serving this dish before reserving a table. 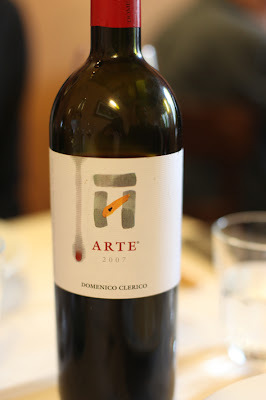 At this particular meal, we drank a bottle of Domenico Clerico's Arte which is one of his non DOC wines. The richness of the fruit in the wine along with the balanced tannins made it a great match for the strength of the cheese and the overall creaminess of the gnocchi. 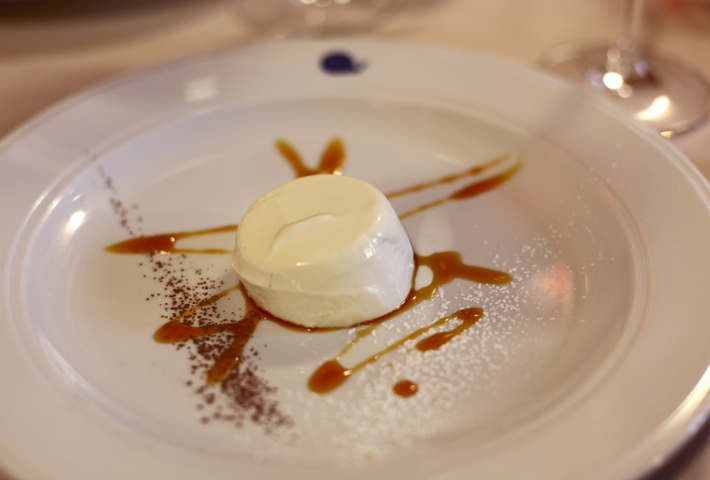 This is THE panna cotta, the sweet counterpart to the perfection of the gnocchi that preceded it. Don't let the "artistic" freedom of the caramel and cocoa fool you. It has structure, but not too much. It is creamy, milky, and perfectly unctuous. There is a certain amount of mystery surrounding this dessert, like the question of what the chef uses to firm the cream; no gelatin is involved, I hear. A lot has do do with cream selection, which changes depending on the time of year. Chef Giuseppi Barbero says, “It has to taste fresh, to still have a milky flavor. Then you have to feel the creaminess and softness when you eat it. It has to be moist...It can be more or less tasty, depending on the year. The animals eat grass in the summer and hay in the winter, so the cream has more of a perfume in the summer and is more creamy in the winter.” This chef's personal quest to master panna cotta has deep roots as well. 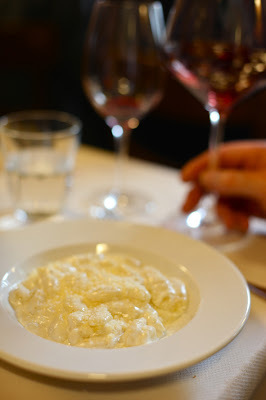 The dish originated in the Langhe region. This little place is one of those restaurants that might not shock you with presentation and new, exciting flavor combinations, but it will absolutely blow you away with studied perfection of simple, regional dishes. If you are in the area, it would be ridiculous not to book a table. If you are in Turin, make the one hour trip. Screw it, even if you are in Milan, the two hour trip will seem well worth it when your loping, satiated, out the door after your divine meal. Oh yeah, and they started Slow Food here.